A HondaJet owned by Polish distillery Chopin Vodka is the first to be made available for private charter in Eastern Europe and charter throughout Europe, the UK, Russia and Scandinavia. It features many modifications tailored to the European market and will be managed and operated by Warsaw-based JetStory, recently named 'Best Foreign Business Airline' by Russian business aviation awards company Wings of Business. 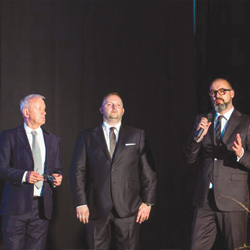 Chopin Vodka founder and CEO Tadeusz Dorda was on hand to accept the aircraft from the Honda Aircraft Company at Chopin-Warsaw airport in Poland. He says: "[With this jet] Honda Aircraft Company's president and CEO Michimasa Fujino has not only abandoned the notion of what is considered conventional aviation, he has redefined the category."